Xist cymbals make excellent mid-range alternatives to the usual suspects. More affordable but still well made. Plenty of character and presence. The 10-inch splash is the only effects models currently offered - something that is both mystifying and in need of remedying. 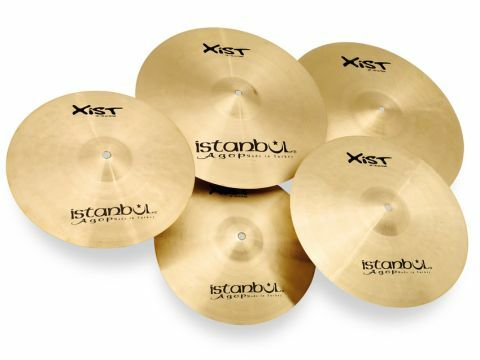 Istanbul Agop's Xist range was created to allow drummers a more affordable route into the Turkish brand. Aimed at younger players, the cymbals feature more contemporary voicings and levels of projection while an accelerated manufacturing process makes them cheaper than regular Istanbul Agop models. Originally launched in 2009, Istanbul Agop has now increased the amount of sizes available. Odd diameters feature prominently among the new models with 15-inch and 17-inch crashes and 13-inch and 15-inch hi-hats making their debut. Larger diameter 19-inch and 20-inch crashes have also been sent for comparison while the choice of rides has expanded to include 21-inch and 24-inch models. "There are unmistakable glimpses of Istanbul Agop's heritage making jazz cymbals, but the Xists will punch through in most modern settings." Xist cymbals are individually cast from B20 bronze. Where casting normally produces raw blanks that require much work to become cymbal-like, Xist models are made using a method that cuts out a lot of the usual intensive shaping work. This process - which Istanbul won't elaborate on further for commercial reasons - results in partially-formed cymbals that need only a third of the amount of hammer blows to complete than regular Istanbul Agop cymbals (around 1,500 compared to 4,500). It's a compromise that Istanbul Agop is happy with as the end result is high quality, still largely hand-made cymbals that are quicker and therefore cheaper to produce. A healthy collection of hammer marks is visible across all of the cymbals - if it wasn't for the Xist logo you'd be hard pressed to distinguish them from any other Istanbul Agop cymbals. Fine bands of lathing cover the cymbals on both sides from the edges to the centre holes and the bells are modestly-sized. Available in either Traditional (non-buffed) or Brilliant finish, the models in this batch all sport the latter which gives them a modern sheen from the off. First to yield to the sticks were the two sets of hi-hats. The 13-inch hats are the brighter of the two, and played gently they sound suitably delicate and precise. Upping the dynamic levels brings about a different response as the sound sharpens to become surprisingly aggressive. They don't leap up in terms of volume - it's more their high pitch that ensures they carry - but they hold their own regardless. The 15-inch hats have a bigger, mellower presence and beneath their brightness lies a deep note with a good degree of warmth contained within. In common with larger diameter hats, they are capable of a gloriously fuzzy wash when played half-open. Closed they remain articulate and supply deliciously broad eighth-notes. Covering 15-inch to 20-inch, mainly in odd number diameters, are the four review crashes. The 15-inch is the most conventional of the quartet, supplying a clean and balanced mix of tone and attack. The three larger models are not only louder (as you'd expect) but are spikier in their tonality. It could be the Brilliant finish influencing things but, whatever the reason, they have a pronounced top-end that makes them significantly brighter and more powerful. In the case of the 19-inch and 20-inch cymbals, hitting them results in near-eruptions in which the high frequencies seethe, ebbing back to reveal a healthy degree of trashiness. Behind this opening attack are progressively deeper notes which round things out with a warm counterpoint. Dwarfed by comparison is the 10-inch splash which delivers a regulation snap of brightness, choking back almost instantly. The two rides are thicker than the other cymbals and so feel substantial, especially the 24-inch model. Both cymbals give a lively and clean response with plenty of top-end present - again probably due to the finish. This brightness translates into a strong stick sound, though some woodiness is also discernible. The 21-inch ride gives a well-defined ping over a layer of wash that doesn't intrude. Tipping the scales at 4kg, the 24-inch has as big a sound as its impressive girth. The wash almost sizzles behind each touch and there is a fair amount of tonal complexity contained within its curves. For such a big cymbal it's surprisingly civilised; though full of character and presence there is nothing jarring or clumsy about it. Istanbul Agop is best known for making jazz cymbals and there are unmistakable glimpses of the company's heritage present in Xist cymbals, from their appearance to their performance. However, they deliver enough of a kick to punch through in most modern settings, with the bigger models being especially capable. The manufacturing process both ensures a good degree of consistency to the cymbals and keeps them affordable.